"These french fries are made in the oven." Preheat oven to 450 degrees F (230 degrees C). Line a baking sheet with foil, and coat well with vegetable cooking spray. 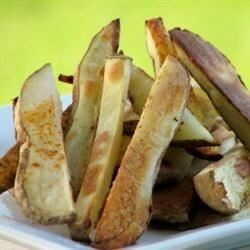 Scrub potatoes well and cut into 1/2 inch thick fries. In a large mixing bowl, toss potatoes with oil, sugar, salt and red pepper. Spread on baking sheet in one layer. Bake for 30 minutes in the preheated oven, until potatoes are tender and browned. Serve immediately.